Salvation And Survival: Are You Willing To Take A Step Towards the Lord? Are You Willing To Take A Step Towards the Lord? I just love this season of my life! Just as I feel the tension from some Christians who aren't in agreement with what I believe God is showing me, He brings me into relationship with someone new who inspires me to keep reaching for greater revelation. In no way, is it my intention to turn my back on those Believers who disagree with me, it is just that God is showering me with mercy as I continue my journey, free from discouragement and discontent. Oh, I have those moments of disappointment, but they are overshadowed by the illumination I am receiving from the Lord. One of the new voices that is inspiring me to seek a greater level of relationship with the Lord is Pastor Chad Norris, Lead Pastor at Bridgeway Church, in Greenville SC. I was introduced to his ministry by Jeremy, my spiritual son, and I have to tell you that a church whose motto is "Rooted in the Word, empowered by the Holy Spirit, building an extended family, and making disciples that make disciples" is one that speaks to my spiritual heart. Jeremy recommended that Mark and I listen to a sermon by Pastor Norris called "Go", and I want to share some of his points, along with my own expanded thoughts on what he has to say. Pastor Norris really challenged me to go to Scripture to see what God thinks about the following aspect of our relationship ... how aggressive am I willing to be in order to step into Jesus' and the Father's plan for my life? Or, in other words, am I content to wait for the Lord to come to me, or am I willing to go up against what has been established by precedence in the Church and instead, go after what the Lord has spoken or promised? Will I listen to the religious people, or as Pastor Norris calls them, "the how you're supposed to do it" people? Or will I trust what I believe is the word over my life, and step into the unknown, trusting that the Lord is going before me to secure that promise? Here's what usually happens among Christians ... we are faced with a situation in our lives and we tell ourselves "I don't want to bother the Lord, so I will just get someone to beg God for me in prayer, and maybe He will heal me". Or, we say, "The Word tells me to wait on the Lord, so in the meantime, I know He is building my character through my perseverance in this season of pain, so I will wait and see if He answers my prayer. And if He doesn't, then it must not have been His will for my life." No! I agree with Pastor Norris that there will always be something in our lives to overcome. And I believe that far too many Christians receive a word from God to move towards Him in those moments of battle in their life. But instead, they wait for Jesus to walk into their situation [and salvation] and take care of it. Here's the deal ... He took care of it at the Cross! We are able to see the Kingdom of God manifest in our lives when we reach out and grab it, because it already came at Calvary! Our faith is only as powerful as what we put our faith in -- and it has to be Jesus! Jesus or the Holy Spirit doesn't give you a prompting to step out in faith, just so He can take you to a safe place where it is quiet and protected. Stepping out in faith is stepping onto the spiritual battlefield! He's prompting you to step into that word you've received --- about a new job opportunity; a physical healing; increased financial provision; restoring a damaged relationship -- whatever it is, He wants you to trust Him as you enter into that battle, trusting that He is in the middle of the battle and that He will defeat all your enemies before you. And we see some great examples in the Bible that show us the result of defying the norm, and taking that step towards Him. Pastor Norris shows us the story of Blind Bartimaeus, who shouted at Jesus, "Son of David, have mercy on me!" He didn't listen to the religious people who "sternly rebuked him, telling him to keep still and be quiet". After all, it was unacceptable by their religious standards, to be yelling at a Rabbi. But what did Bartimaeus do? "He kept on shouting out all the more". The response? Jesus told His disciples, "Call him to come to me". Bartimaeus jumped at the chance, threw his beggar's robe off, and made his way to Jesus. The result? 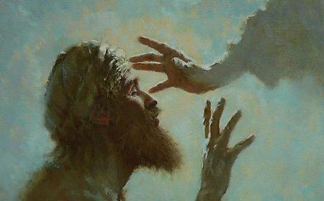 His faith healed him; and the Greek word here is sozo, indicating he was delivered, saved, restored, healed, rescued, preserved, and made whole with his sight restored. Hallelujah! But we see the same kind of breakthrough come in the lives of others who weren't willing to sit back passively, waiting for Jesus to solve their problems. We see it in the life of Zaccheus, the wealthy tax collector, who wasn't willing to miss seeing and hearing Jesus because of his short stature. He was so desperate for an encounter with the Lord that he defied protocol and climbed a sycamore tree to gain access to Jesus. Result? Jesus called to him and Zacceus' life changed forever as he received his salvation. We also see it in the life of the woman who had a bleeding issue for 12 years. She was not content with being passive and hoping that the Lord might see her and heal her. Remember, it was unlawful for her to even be in the midst of the public, but she, too, was willing to risk the scorn of the religious people so that she might grab hold of her healing. Her result? Her faith was strong to heal her because she had put her faith in the One who had the power to heal. And we can't forget the instance in Matthew 14 when Peter goes against conventional wisdom and steps out of the boat in the middle of a raging storm to walk to Jesus when the Lord commands, "Come!" Peter was able to defeat the laws of gravity and this world as long as he kept his eyes on Jesus. But as soon as he began listening to the voices of the scared disciples in the boat, or the voice of human reason in his head, he broke that connection of faith with Jesus and began to sink. Here is what we need to understand.... When we receive a word [from Jesus] to step out in faith, He has already positioned Himself in the midst of the circumstance, and is actually waiting on us to take a hold of that word and the promise that accompanies it. But too many of us Christians wait for Him or the Father to perform that word out of His grace. For instance, we tell ourselves we have received a word that the Father wants to bless us with increased provision through a new job offer. Instead of understanding that He is waiting for us to step out in faith and make ourself available by putting out job feelers or networking our contacts, we tend to stay passive and wait for the job to come to us. We need to understand that the Kingdom can't advance in our lives if we don't know how to take hold of it violently; that is aggressively by pressing in to it, unwilling to take "no" for an answer. In summary, give this a thought ... all of these people had challenges to overcome. What if Bartimaeus or Zaccheus or the woman with the blood issue had not been willing to press into their encounter with Jesus? What if they had ignored that prompting to be aggressive and seek Him out? Could God have bestowed favor on them and had Jesus heal them anyway? Of course! But I believe that would be opposing the principles that He set concerning His character. I believe that He likes to see breakthrough in people's lives due to us trusting in the word He sends to us, confessing it, and then taking a step towards Jesus. That's the epitome of Faith. And remember, without Faith, it is impossible to please God. These people all modeled aggressive faith which saw them walk away victorious. So, the next time you receive a word over your life, cooperate with that word given and take a step towards the promise. We can either bless or curse ourselves [or our churches] by confessing the word (believing it and acting on it), or holding back out of fear that it might not come true, and then blaming God for why it didn't manifest. (And I include the times that we take a step, get scared, and take a step backward). That's opposing those principles of God's character! It's time we realize that "waiting on the Lord" does not always mean being passive and safe and secure. Sometimes, it means we are to be aggressive and renew the strength of our faith by trusting the word we have received. Sometimes, "waiting on the Lord" means being persistent and fighting the good fight of Faith. Jesus has promised that He will always be with us. 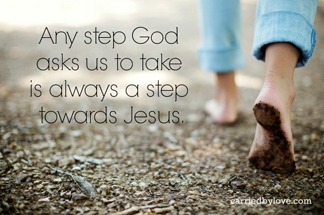 Take a step towards Him ... He will be there! 1 Timothy 6:12 So fight with Faith for the winner's prize! Lay your hands upon eternal life for this is your calling -- celebrating in faith before the multitude of witnesses!" We are not those who have shrunk back into perdition. The Holy Spirit is really working on my heart for my fellow Christians who fearful of all that the Lord wants us to walk in. At the same time, He is humbling me to be patient and continue to love them, even when we disagree. I am saddened by the friction and conflict I see in the Body. We need to pray that we can love each other in unity.